Islam arrived into Indonesia via overseas merchants, initially from southern India and Gujarāt in western India. By the late 13th century the coastal states of northern Sumatra were beginning to accept the new religion; the first Muslim ruler in northern Sumatra was Sultan Malik al Saleh of Pasai. Islam spread slowly until the rise of the sultanate of Malacca (Melaka) on peninsular Malaysia’s western coast in the early 15th century. Malacca had become a major spot on the trade route between the Moluccas (Spice Islands) and Europe, which increasingly sought Moluccan spices. As a result, Malacca gained commercial and political power and also became the major center in Southeast Asia for the spread of Islam. Malacca’s gain came at the expense of Majapahit. Merchants from Majapahit in northern Java traveled to Malacca to trade Javanese rice for Moluccan spices, and many merchants converted to Islam. Malaccan princes in turn became powerful from their trade connections and began exerting commercial and military pressure on Majapahit. By the early 16th century, Majapahit had virtually disappeared. Meanwhile, Portuguese traders captured Malacca in 1511. The European intrusion changed the existing patterns of trade and led to the growth of several strong Muslim states, each competing with the others for trade routes in Indonesia. One of the most powerful of these states was Aceh in northern Sumatra. During the 16th century Aceh launched frequent attacks against Portuguese Malacca, either alone or with other local Muslim states. Under Sultan Iskandar Muda, Aceh controlled all of Sumatra’s pepper-trading ports except those in the extreme south, and its influence extended to parts of the Malay Peninsula. Another important trading state of the period was Makassar. 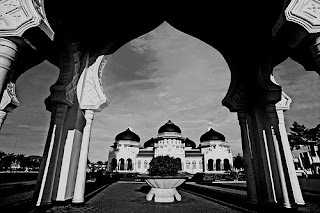 Situated in southwestern Sulawesi, Makassar and its people converted to Islam in the early 17th century. Bantam, in western Java, was the Muslim successor to the Hindu kingdom of Sunda. Bantam controlled southern Sumatra and thus the vital Sunda Strait. In the late 16th century a new Muslim kingdom of Mataram arose in central Java and began to absorb many of Java’s maritime principalities. And finally at now, Indonesia become the biggest moslem country.